Trying to find the best place to buy a new mattress in Alabama? Anthony Burgess is famous for saying: “Laugh and the world laughs with you, snore and you sleep alone” and unfortunately he’s right. Partners struggle to find a mattress that is “just right” for each of them, and sleep disorders such as sleep apnea are more than common in the United States. Often left alone to toss and turn on their own, those who struggle with sleep can find some relief with the right mattress. But how do you know how which mattress is right for you? How do you know who to trust. With so many mattress options, it can be one of the most stressful purchases for shoppers. Which is why we took the time to review some of the top-ranked mattress stores in Alabama. We looked mattress shops that offer quality products, a wide range of options, quality customer service, and some other essentials- return policies and speedy delivery. Today with a flourishing industry, you can readily find mattresses in Birmingham, Montgomery, Mobile, and Huntsville and in other parts of Alabama as well as much as in Auburn, Tuscaloosa, Florence, Marion, and Selma. 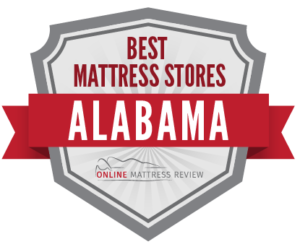 We selected some of the largest metropolitan areas across the state of Alabama and found the highest-ranked mattress shops within each region, and this is what we came up with. If you are looking for the best mattress shop in Birmingham, we can help. Mattresses are a major purchase, and we understand that picking and sticking with a mattress can be stressful. We took a look at the top-ranked mattress shops in and near Birmingham- the best for coverage, selection, customer service (this includes knowledge of the product) and other essentials (like delivery options, and refund policies). Here’s what we found. Mattress Firm seems to be king in the Birmingham area. Mattress Firm does a nice job covering a lot of ground. Mattress Firm Homewood (543 Brookwood Village) is a nice place to head if you are – over 55- to suit all kinds of needs. The staff at the homewood location really understand the products and will never push you to make a purchase that is out of your comfort level. One of the best features to actually choosing a “big box chain” operation is the return policy- over the course of 120 days you will be able to really try your mattress. Mattresses often come with a recommended month adjustment period. If you realize before that 120 days are up that this mattress is not for you, Mattress Firm does offer a money-back guarantee. The other Mattress Firm we recommend is in Hoover, Alabama (4340 Creekside Ave.)- just outside of Birmingham. If you are looking to try something other that Mattress Firm, you could try Bedzzz Express (4500 Montevallo Rd. Birmingham, AL). This is a great option for a person who needs a great mattress fast, or someone who is looking to take their time. The customer service really shines here, and the sales team are known to be good listeners, patient, and true to their word. If you are looking for a high quality and affordable bed Bedzzz Express is a great option. The iciding on the cake may be the next-day timely delivery. Have you ever wondered: Where can I find a mattress store in Montgomery, Alabama? We can help. Purchasing a mattress doesn’t need to be so stressful, though we understand the pressure- you will spend ⅓ of your life on this purchase, sales professionals tend to be pushy and sneaky, and you need to find something that works for your sleep patterns. This is why we went ahead and examined the best mattresses stores in Montgomery- we were looking for options that did not break the bank, had a selection for all types of sleeping patterns, and quality customer service- a patient and knowledgeable sales team. Mattress Firm Montgomery East (6951 Eastchase Place) is one of the highest ranked mattress stores in the area. Like all all Mattress Firm locations, you can take advantage of their 120 day money back guarantee. We really appreciate the high quality of customer service that comes from the knowledgeable sales team- you will never be pressured into a sale that makes you uncomfortable, and you have the freedom to take as much or as little time as you want. If you are looking for a quality and affordable mattress, try Bedzzz Express (7417 Eastchase Pkwy). We like this location for the high quality products available at very reasonable prices. The owner even offers free delivery! Montgomery Overstock (620 N. Perry St.) is a find place to head for an affordable mattress and other furniture to complete your furnishing needs. If you are looking to shop with a family-run business, head here. The staff are friendly, patient, and knowledgeable. If you need to find the best mattress shops in Mobile, we can help. Mattress shopping is not everyone’s favorite. However, it’s an essential purchase- for some, the pressure of finding something that is “just right” is even more stressful. What if my mattress doesn’t work out? How can I return my mattress? How do I know if a mattress can fix my back pain? And on an on go the worries. We did our best to alleviate some if not all of those worries when we took a look through the top-ranked mattress shops in the Mobile, Alabama area. We looked for mattress stores that offer a wide-range of mattresses, quality customer service, and other user-friendly experiences like same-day or next-day delivery, and essential return policies. While no two mattress shops are the same, we did our best to find some that have either some or all of those elements. Mattress Firm Mobile (3682 Airport Blvd) is one of the top-ranked mattress stores in Mobile. As with all Mattress Firm locations, Mattress Firm Mobile offers a 120 day money back guarantee. The sales team at this location are extremely knowledgeable and patient. You won’t feel pressured to make a purchase quickly or out of your price range. Another Mattress Firm location we like is Mattress Firm Sheldon (7765 Airport Blvd.). If you are looking for an affordable mattress and other furniture, you could try Tillman’s Corner Upholstery and Mattress. This family run establishment has been in business since 1970. With over 65 years of experience under their belt, Tillman’s has learned the art of customer service. There are a wide-range of mattresses available of all sizes. If you prefer to shop local and shop small, you could try Tillman’s. If you’re wondering: Where’s the best mattress in Huntsville, Alabama? You have come to the right place. Huntsville attracts quite a diverse community with all kinds of needs. Whether you’re hunched over a desk, standing all day in a lab coat, or hustling and bustling waiting tables, you’ll need a quality mattress to help you get optimal sleep at night. Bed in a Box stores have some limitations, and of all products, it’s essential that you try before you buy. Which is why we took the time to comb through the highest ranked mattress stores in Huntsville- to help you save some time combing through options. Bedzzz Express (4800 Whitesburg Blvd) seems to have the whole package- a patient and knowledgeable staff, great selection of mattresses, affordable prices, and free delivery. Mattress King Clearance Center features dozens of mattresses for affordable prices. Mattress King Clearance Center will match and likely beat any of the competitor’s prices. And if you are in a pinch, don’t lose sleep over it- Mattress King Clearance Center offers next-day delivery. Haverty’s Furniture is a furniture store that also sells mattresses and is a great place to head if you need more than just a mattress. The delivery team is a fast and efficient, and the sales representatives are courteous and knowledgeable. If you are looking to take your time shopping try Haverty’s. Of course mattress stores are available in areas of Alabama outside of those already covered. In or around Auburn, Gulf Shores, Dothan, Gadsden, Hoover, Cullman, Foley, Anniston, Fairhope, Prattville, and others all have local mattress stores or at least mattress stores in the region.